There was an air of positivity and goodwill at the media meet of Aishwarya R Dhanush’s second directorial venture Vai Raja Vai on Friday evening in Chennai. Speaking at the function, Aishwarya said “I request audiences to forget ‘3’ which was an intense love story and come to see Vai Raja Vai with an open mind and I promise it will be a complete commercial entertainer”. Aishwarya also revealed that both her dad Rajinikanth and husband Dhanush have seen the film and appreciated the entire team for making a good entertainer. She also broke the news that actor-director SJ Suryah has done a special song ‘Vantha Kadha Vaazhntha Kathai’ in the film. This song was exclusively premiered to the press and it had Suyah as an auto driver. Ash was in her elements as she conducted herself with both elegance and elan answering each and every question shot at her with ease. When asked why she took two years to complete the film, Ash took the blame and said: “I am to be blamed as this film had lot of artists, too many different locations including a cruise and above all the unit had to wait for fall season in Japan to shoot a song”. She also thanked for the support and patience of Producers AGS and it was their strategy to release Anegan before Vai Raja Vai, which justified the delay. The icing on the cake was speech by Vivek who looked dashing in his new salt ‘n’ pepper look. He took a dig at each and every person on the dais and his observation of the team during the shoot was hilarious. He even said that “I have started having a crush on Taapsee after working with her”. When Vivek explained about his ‘beer time’ with Manobala on the cruise and SJ Suryah’s ‘item number’ which will attract girls to the theatres, the entire press had a hearty-laugh. 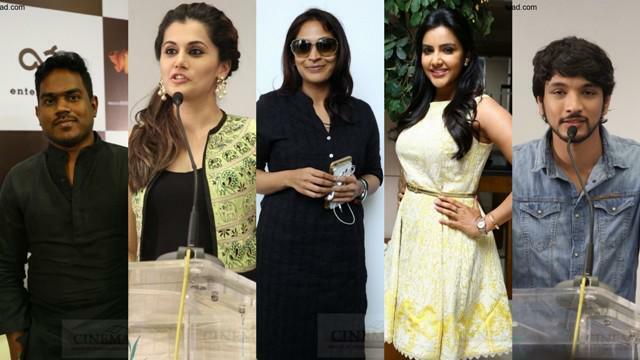 Taapsee, Priya Anand, Gautham Karthik, Studio Green Gnanavel Raja. Daniel Balaji, SJ Suryah, Manobala and Yuvan Shankar Raja spoke at the press meet. Produced by AGS Entertainments, Studio Green will be releasing Vai Raja Vai on May 1.